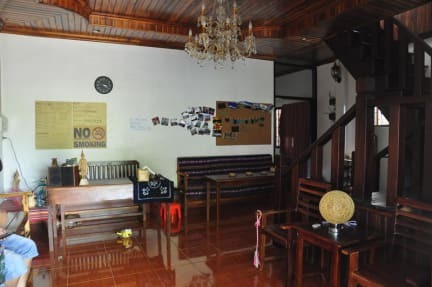 Muenna 1989 Guesthouse is located in the center area of Luang Prabang. It is in a beautiful, quiet and peaceful alley which is beside Nam Khan River. It only takes 10 munites walk to night market, and only 5 munites walk to Utopia and bar street. The guesthouse is surrounded by restaurants and shops. There are 2 mini markets nearby. 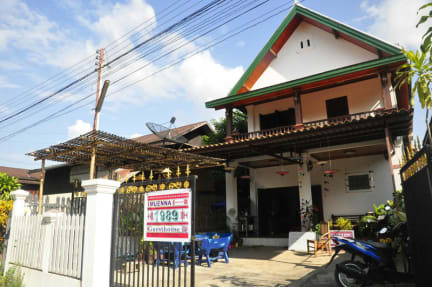 Featuring free Wi-Fi throughout the property, Muenna 1989 Guesthouse offers accommodations in Luang Prabang. It is in a tradition villa of Laos and has a beautiful yard, which is surrounded by plants. You can have beers and relax with poeple around the world. 1. Check in from 14:00pm and check out until 12:00 noon. 2. Both cash and credit card (Visa, Master Card) are accepted upon arrival. 3. Cancellation policy: Up to 7 days advance notice before the arrival date is required. 4. It has curfew in Luang Prabang. You have to be quiet after 23:30pm.